James Golding returns to the winner’s circle of the Dunlop series this weekend at the Wilson Security Sandown 500 after taking out Race Three. Golding completed the race with a best lap time of 1min11.56, keeping solid gap of 2.3 seconds ahead of Le Brocq who finished in position two. Golding has demonstrated smart and clean racing this weekend, balancing double duties with James Moffat in the main game. Golding said he knew the team had implemented a good strategy going into the race- Race three being all about the tyre strategy on a drying track at Sandown Raceway. The choice of tyres, tidy racing and no mistakes won young gun James Golding the race. Le Brocq started the race from the back of the grid, however managed to make a massive recovery, finishing second and proving his determination on stealing back the championship lead after yesterday’s disappointing five-crash incident. Le Brocq and Davies battled for P2 with five laps remaining. Le Brocq making his way through after Davies was blocked going onto the front straight. Davies finished the Race in P3 2.7 seconds behind front-runner Jack Le Brocq, making progress in the category at Sandown this weekend also performing double duties. The podium finish for this weekend’s Dunlop Series racing at the Wilson Security Sandown 500 was Garry Jacobson finishing first, Shae Davies in second and Richard Muscat in third. Jacobson has stolen the championship lead this weekend 67 points ahead of teammate Jack Le Brocq. Despite Le Brocq’s recovery in today’s race, he is under investigation after contact with Taz Douglas forcing him out of the race with lots of damage to his Holden Commodore VE. 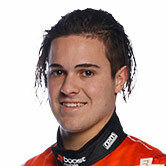 Young Gun Kurt Kostecki had a dynamite start, wrestling veteran Paul Dumbrell for the lead and controlling the start in the opening lap of the race. After two rounds in the main game with Team 18, Kostecki has returned to the Dunlop Series this weekend with heightened experience fighting hard for the front. It was unfortunate for Kostecki, his tyre strategy did not work in his favour in today’s race, however he managed to race the best he could on a wet degrading tyre. A safety car in the opening lap was called when Chelsea Angelo went off track at turn three after Anton De Pasquale came into the side of her forcing her off. Her race over for today. Today’s race proved much sharper in comparison to yesterday’s pinball episode, however the Dunlop Series young guns have created an action-packed weekend of racing in some difficult race conditions.